Q796, Other software dynamics processor from SKnote. SKnote has announced the release of Q796, the first in its new series of plug-ins modeled on classic hardware devices. It is a stereo device with stereo sidechain, built for mastering but great on single instruments, according to SKnote. A look-ahead function (up to 10ms) and full graphics have been added to the analog emulation. o Feed-forward (the modern way) and feed-back (the vintage way) modes. o Gain reduction limit (great for invisible squashing). o Distortion (static and dynamic; starts over the threshold and increases with gain). o Long time integration (an additional very slow time constant). Limiter: a very fast limiter (with brickwall mode to 0dB). 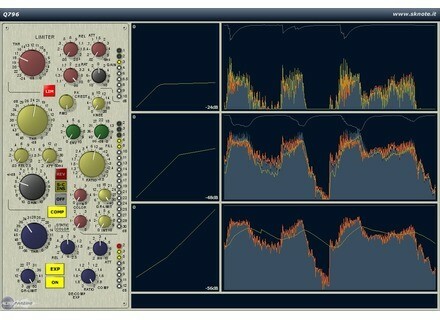 Q796 is available for Windows as a VST effect plug-in priced at €129. A fully functional demo version is now available for download (a short burst of noise is added every 20 seconds).